Hooked on Needles: Knitted Entrelac Baby Blanket ~ Finished! Knitted Entrelac Baby Blanket ~ Finished! 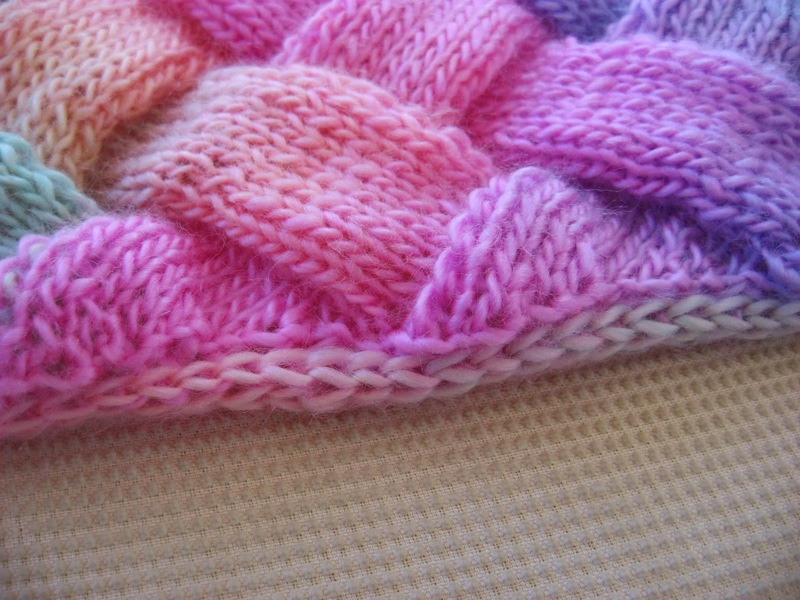 Entrelac knitting was not nearly as complicated as I expected it to be. Have you tried it? I had been intrigued by this technique for years, but was so intimidated by it that I never even gave it a chance. Then I saw this baby blanket kit from Mary Maxim, and it was on a good sale, so I decided this was my opportunity to dabble in this stitch and see what it was all about, besides also getting a little stash of some awesome yarn that I could use even if I didn't like doing entrelac! 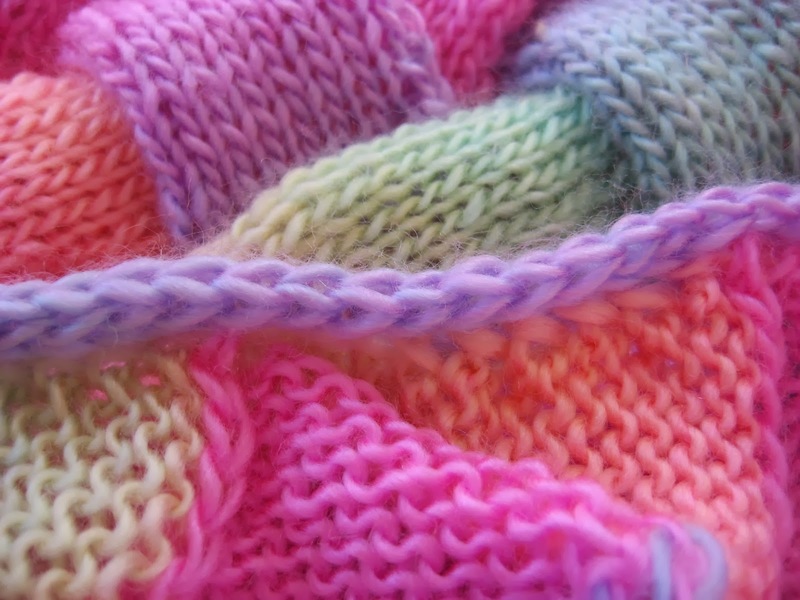 Click HERE to read more about this entrelac journey. Or continue reading to see how it ends! 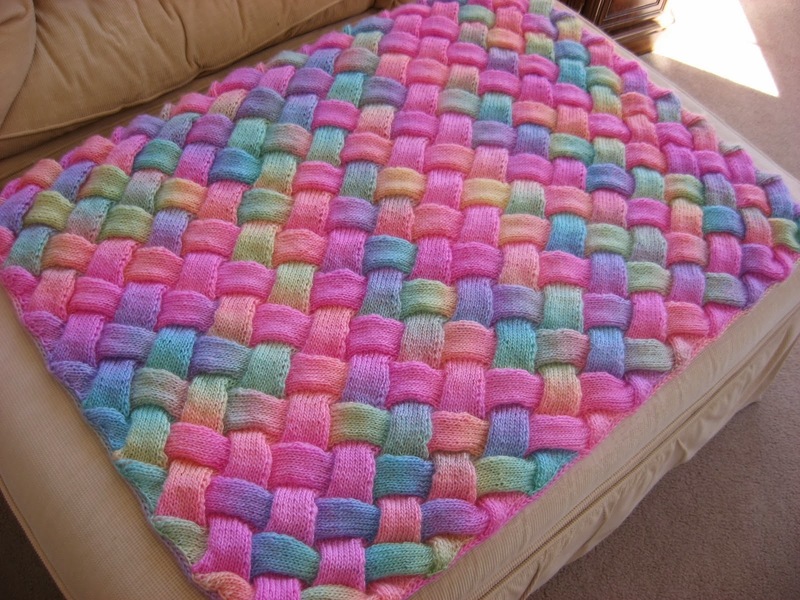 The border for this blanket is just a little attached i-cord border that gives the edges of the blanket a nice finished look. You can barely notice it in this picture, but it's there! 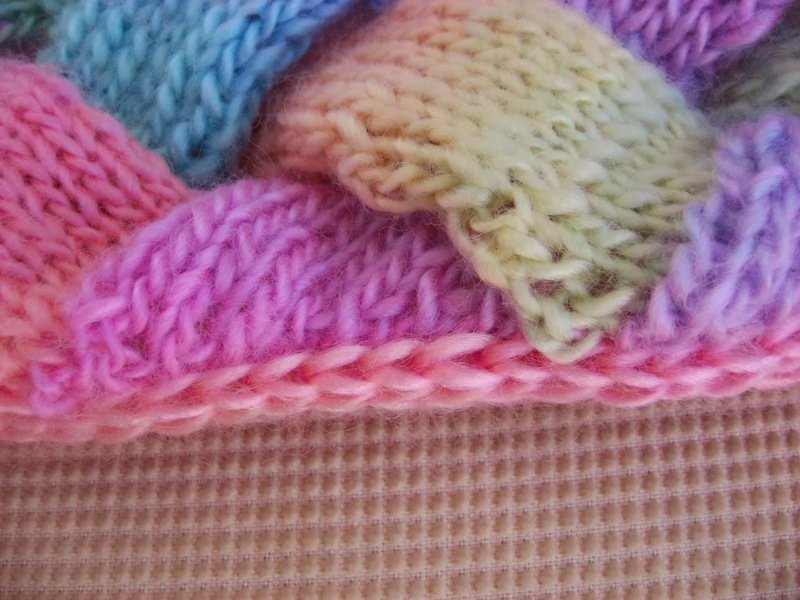 Here's a close-up of the i-cord border. Isn't it pretty? This view is from the front. And this view is from the back side of the blanket. I-cord can be made as wide as you want, but this one is just a 4-stitch i-cord and it is attached to the blanket as you go by picking up one stitch from the edge of the blanket and knitting it together with the last stitch of the i-cord before sliding the stitches back to left needle and knitting the next four stitches. The instructions included with the pattern were just a bit confusing, saying to pick up all the stitches along one side of the blanket before beginning the i-cord. I tried it and just couldn't get it to work, so I googled how to knit an attached i-cord and viewed several different videos, each showing a different way to knit an attached i-cord. With the information I had picked up from all the videos, I was able to work out my own way to do the border and it worked out just great! 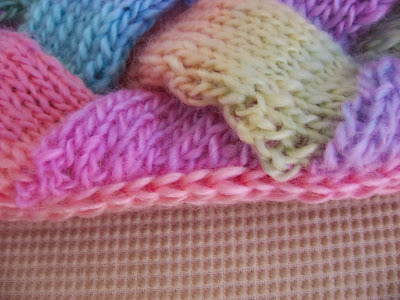 I ended up using two double pointed needles and picking up about 10 stitches at a time from the blanket, knitting the i-cord attached to those 10 stitches, then picking up the next 10 and so on until I was back at the beginning. I found it much easier to manage with only a few stitches at a time. This project was a great learning experience for me with two new techniques now mastered, entrelac and i-cord knitting. Don't be afraid to get out of your comfort zone and try something new. You just might be surprised how fun it is, and have a new stitch or technique to add to your knitting/crocheting/crafting resume! It turned out great! I just might call on you to help with the i-cord ... but not for awhile yet. The baby blanket came out great! I've never heard of i-cord border before. Isn't YouTube wonderful...chock full of information. But I certainly would leave it up to you to find a better way to do something. Your instructions for the border sound simple enough. Thanks for sharing. I'm sure your recipient is going to LOVE it! Beautiful and I love the colors!! Entrelac Baby Blanket is Off the Needles!